Heavy-duty Pressboard classification folders feature 1" capacity prong fasteners inside front and back covers and 1" capacity prong fasteners on both sides of the divider. 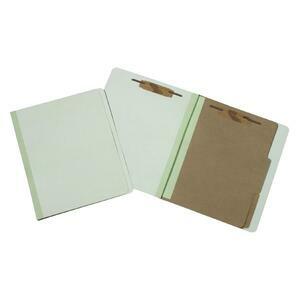 Folders include a Tyvek-reinforced expansion gusset with 2" capacity. Outside covers are made of heavy-duty, 25 point stock, and dividers are made of 17 point kraft paper. Pressboard is made with 30 percent post-consumer material and meets Executive Orders 13514 and 13423. Product packaging is made using 100 percent recycled content.